The mine hoist order to ABB for world’s largest zinc mine paves the way for increased productivity and improved safety in the Indian mining industry. ABB, the leading power and automation technology group, has won an order for three complete mine hoist systems including related shaft equipment, to help Hindustan Zinc move its production at the Rampura Agucha mine from an open-pit to an underground operation. The new hoist systems will enable Hindustan Zinc to reach and exceed their production targets. ABB’s scope of supply comprises, among other things, two friction hoists and one single drum hoist including both mechanical and electrical parts. ABB also delivers switchgears and power cables, as well as the complete shaft equipment for the mine hoists. These hoists will be delivered between 14 and 16 months after the signing of the contract which took place in June 2013. The Rampura Agucha mine is located in Rajasthan, in the northwest of India, and is the world's largest zinc producing mine. Reserves and resources of Rampura Agucha as of March 31, 2013, are about 109 million tons with a best-in-class zinc-lead reserves grade of 15.4%. At present the Rampura Agucha mine is producing 6.15 million tons ore per annum from the open-pit mining operation and is treating the same in a beneficiation plant. With the present system of mining method (open-pit), the mine will be operative up to a level that is 372 meters below the surface. Beyond this level the mineral reserves and resources are to be extracted by suitable underground mining methods. New water pipeline and pump infrastructure to support economic growth in eastern Botswana. Zurich, Switzerland, Aug.15, 2013 – ABB, the leading power and automation technology group, has won an order to provide an instrumentation, control system and electrical equipment (ICE) package for a new water pipeline and pump station to be constructed in eastern Botswana to support growing demand driven by new mining ventures, power sector developments and a growing population around the capital, Gaborone. As part of the turnkey solution, ABB will supply its SymphonyTM Plus total plant automation system to monitor and control the pump stations and reservoirs located along the 360 km water network. The Symphony Plus architecture enables aggregation of data across distributed geographies and is ideal for applications such as the expansive Botswana water network. It is also specifically designed to reduce engineering time and effort from custom development, and minimizes commissioning time and risk of misconfiguration during startup. The integrated system has provisions for local and remote monitoring and control of the entire plant. ABB will also supply an ICE package and a range of products including motors and drives, switchgear, transformers and instrumentation equipment to maximize the operational efficiency of the system. The overall water project is being executed by a joint venture comprising the Middle East-based construction firm Consolidated Contractors Company (CCC), and the South African construction and engineering group Wilson Bayly Holmes-Ovcon (WBHO). It is scheduled for completion in 2014. ABB is present in more than 20 countries in Africa with around 5,200 employees. The company is aiming to grow its business in the region at least twice as fast as the global GDP growth rate through 2015. Symphony Plus is ABB’s powerful, versatile and scalable automation and control platform for the power and water sectors. About 6,500 Symphony installations are automating, integrating and optimizing more than 4,500 power and water applications around the world. Power plant and substation solutions to facilitate energy efficiency and grid reliability. ABB, the leading power and automation technology group, has won orders worth around $38 million for a new 1,320 megawatt (MW) coal-fired power plant, which is under construction in the southern Indian state of Andhra Pradesh. The orders were placed by NCC Ltd, the engineering, procurement and construction (EPC) contractor for the plant and a leading Indian construction and infrastructure company and were booked in the second quarter. ABB is responsible for the design, engineering, installation and commissioning of the electrical balance of plant (EBoP) as well as a 400-kilovolt (kV) gas insulated switchgear (GIS) substation, scheduled for completion in 2014. India has an installed power generation capacity of over 210,000 MW, of which approximately 57 per cent is based on coal. According to estimates of the International Energy Agency (IEA), national energy demand is projected to more than double over the next 25 years. Oil and coal are expected to maintain their shares in the primary energy mix and India is expected to displace the United States as the world’s second-largest coal consumer by 2025. Over 60 per cent of the rise in energy demand comes from the power sector, reflecting the enormous demand for electricity in India. The EBoP solution comprises a range of ABB power products, which have been integrated into an optimized system to suit operational requirements. Some of the major product supplies include generator circuit breakers, medium- and low-voltage switchgear, transformers and protection equipment. Based on a proven fast delivery concept, the solution reduces overall project costs and mitigates risk. The GIS substation ensures a compact footprint and deploys state-of-the-art ABB technology to ensure safe and reliable power transmission. The Nellore plant will be a ‘super-critical’ thermal power plant, which is considered more efficient than conventional coal-fired power plants as they generate more energy, consume less coal and produce fewer emissions than traditional sub-critical technologies. ABB recently delivered a similar EBoP solution for a new 1,600 MW super-critical power plant owned by the Andhra Pradesh state utility, APPDCL, which is located close to Nellore in Krishnapatnam. Zurich, Switzerland, Aug.7, 2013 - ABB, a global leader in power and automation technology has been selected by Fujian Mawei Shipbuilding Ltd. in China, to supply 24 dry-type propulsion transformers, for installation in 12 diesel-electric powered offshore platform supply vessels. The 2,300-kilovolt ampere (kVA) 480-volt dry-type ABB propulsion transformers will be built at the company’s Trasfor facilities. ABB acquired Trasfor Group, a leading manufacturer of dry-type transformers and inductors for low-voltage and medium-voltage applications. Compact dry-type transformers offer high efficiency and reliability due to fewer moving parts, as well as lower noise levels and weight. They provide electrical propulsion systems with power, helping to reduce carbon emissions at sea, and also improve operational accuracy during critical maneuvers. “ABB`s oil-free dry-type transformers are a safe, reliable, cost-efficient and environmentally friendly technology, which makes them ideal for applications such as onboard ships, where space is limited”, said Markus Heimbach, head of ABB’s Transformers business, a part of the company’s Power Products division. “These transformers also minimize noise levels and eliminate contamination and fire risks“. There is a growing demand for dry-type transformers that use materials such as resin for insulation instead of oil, making them less flammable and reducing their environmental impact. Fujian Mawei Shipbuilding Ltd. was founded in 1866, and in addition to being one of the oldest shipyards in China is also the largest shipbuilding and ship-repair base in south-east China. Located in the Fuzhou Economic and Technical Development Zone, the company specializes in oceangoing vessels, marine engineering and ship repairs, and is a leading builder of offshore support vessels. Samsung’s new $3 billion liquid crystal display production facility in Suzhou is the biggest single investment ever made by a South Korean company in China. The state-of-the-art facility is safeguarded from potentially crippling power disruptions by an ABB power protection solution – one of many that ABB has supplied to semiconductor companies in Asia. Situated at Samsung’s huge production complex at Suzhou Industrial Park in Jiangsu province, the new 7.5 generation fabrication line is capable of producing 100,000 glass substrates a month. Each substrate can be divided into eight 42-inch panels, six 46-inch panels, or three 55-inch panels, which is enough to produce between 300,000 and 800,000 liquid crystal display (LCD) TV sets a month. Production at the new plant is expected to start in the first half of 2013. Together with Samsung’s existing LCD module production plant at its Suzhou complex, the new LCD line enables Samsung to create an integrated LCD production base for China, by far the world’s largest market for LCD televisions. To ensure that production at its multi-billion dollar investment is not brought to a standstill by power failures, voltage sags and other electrical disruptions, Samsung selected ABB to provide the new plant with a power protection solution. The solution comprises eight ABB PCS100 UPS-I low voltage uninterruptable power supply (UPS) units, which have a combined protection capacity of 16.5 megavolt amperes (MVA) of electric power. The PCS100 UPS-I is a single conversion UPS with an ultra-capacitor energy storage system coupled to a back-up inverter system to allow the downstream load to remain operational during short power outages and very deep voltage sags. Recently Samsung selected 22 PCS100 UPS-I units for its latest mega-investment in China – the $7 billion NAND flash plant in Xi'an. The facility will have a monthly output of 100,000 nanometer chips and is expected to become fully operational towards the end of 2013. NAND chips are used primarily in memory cards, USB flash drives, solid-state drives, and similar products for data storage and transfer. To date, ABB has supplied more than 680 megawatts of PCS100 power protection solutions to high-tech semiconductor and flat panel LCD manufacturing facilities worldwide. Zurich, Switzerland, April 10, 2013 – ABB, the leading power and automation technology group, has won an order worth around $150 million to supply converter transformers, DC (direct current) filter capacitors and key components for converter valves for the world’s highest capacity power link in China. The order was booked in the first quarter. Once completed in 2014, the 8,000 megawatt (MW) Xiluodu-Zhexi link will be capable of transmitting the energy equivalent of eight large power plants and supplying 40 billion kilowatt-hours of electricity per year – enough to meet the needs of over 11 million Chinese consumers. The use of renewable hydropower will also help avoid combustion of more than 12 million metric tons of coal, reducing potential carbon emissions by about 34 million tons annually. The 800-kilovolt (kV) ultra-high-voltage direct current (UHVDC) transmission connection will transport clean hydropower over a distance of 1,670 kilometers, from Yibin in Sichuan province in southwest China to Zhejiang province on the east coast. ABB`s scope of supply for the project includes converter transformers, DC (direct current) filter capacitors and key components. As part of the transmission process, converter transformers provide a critical interface between the DC link and the alternating current (AC) network. High voltage direct current (HVDC), a technology pioneered by ABB almost 60 years ago, enables large amounts of electricity to be transmitted over long distances with minimal losses. UHVDC transmission is a development of HVDC, and represents the biggest capacity and efficiency leap in more than two decades. ABB is a world leader in HVDC transmission technology, with around 90 HVDC projects around the world with a combined transmission capacity around 95,000 MW. UHVDC transmission is increasingly being deployed in geographically sizeable countries such as China where energy is consumed far from its source. By making it possible to transmit power, especially from renewables, over long distances, UHVDC reduces dependency on fossil fuels and curbs potential carbon dioxide emissions. Transformers are essential parts of an electrical grid, enabling the efficient and safe conversion of electricity between different voltage systems. ABB’s transformer portfolio includes power transformers, dry and liquid distribution transformers, special application transformers and related services and components. The chairman of ABB, Hubertus von Grünberg, has told a meeting of Chinese officials and business people how power solutions can contribute to sustainable cities, in the world’s most rapidly urbanizing country. Beijing, March 26, 2013 - The chairman of ABB, Hubertus von Grünberg, has told a meeting of Chinese officials and business people how power solutions can contribute to sustainable cities, in the world’s most rapidly urbanizing country. Addressing the China Development Forum in Beijing on March 23, the ABB chairman said one of China’s biggest challenges in the coming years would be to meet its energy needs while at the same time cutting carbon emissions. Von Grünberg explained that “smart cities” were the key to ensuring that China’s economic growth brought improvements in quality of life in an environmentally sustainable way. He said rapid modernization and the construction of new cities meant that China had an opportunity to develop its urban centers in a top-down manner to realize a broader city vision. To illustrate how smart cities function, the ABB chairman drew on the company’s experience in developing smart-grid solutions, such as the Stockholm Royal Seaport, a new sustainable city quarter of the Swedish capital, and the construction of a nationwide network of fast-charging stations for electric vehicles that ABB recently installed in Estonia. Von Grünberg also referred to ABB’s intelligent building system in Terminal 3 at Beijing’s international airport, which has cut energy consumption for lighting by 20 percent. He concluded by saying that ABB would be honored to assist the Chinese government in finding sustainable solutions to the challenges of urbanization. The China Development Forum is an annual gathering, held in Beijing, that allows global business leaders and academics to interact with China's top decision makers and economic planners. It was founded in 2000 by the Development Research Center of the State Council, China's Cabinet. ABB is a world leader in smart-city technologies and is ranked as one of the Top 10 smart-grid vendors by GTM Research. It is a member of the Smart Cities Council and is represented on the European Technology Platform for Electricity Networks of the Future, also known as the Smart Grids ETP. 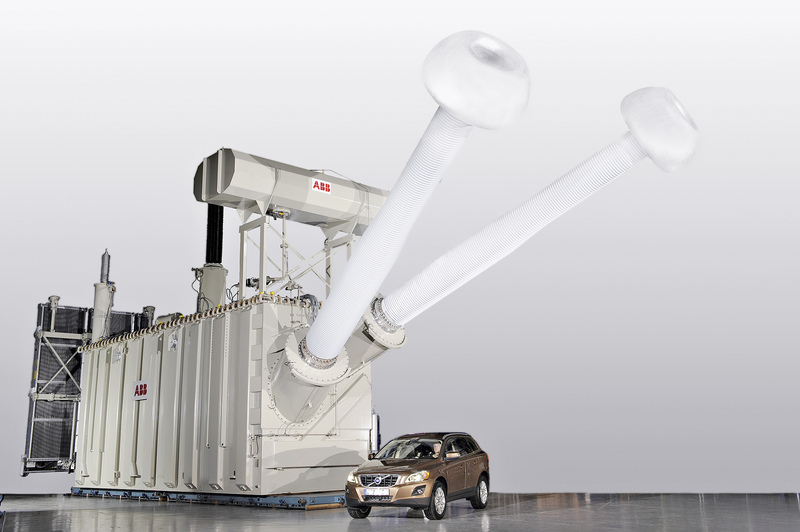 Next: ABB launches world’s first low-voltage breaker to be used for energy management and smart grid communications. Integrated propulsion and electrical systems to maximize performance and energy efficiency of icebreaker expected to operate in 2 meters of ice at minus 35 degrees Celsius. Zurich, Switzerland, October 1, 2012 – ABB, the leading power and automation technology group, recently won an order worth $35 million from the Baltic Shipyard Ltd. to supply powerful propulsion and energy efficient electrical systems for a new icebreaker vessel under construction for Russia’s state shipping company Rosmorport FSUE. The order was booked in the third quarter of 2012. The 25 megawatt (MW) line diesel-electric icebreaker is the next-generation multifunctional diesel-electric icebreaker. The navigation area of the icebreaker is the Northern Sea Route, the Arctic seas and estuaries of rivers discharging into the Arctic Ocean. The icebreaker is able to proceed continuously both ahead and astern at the speed of 2 knots in compact ice field up to 2m thick with 20 cm of snow cover and temperatures as low as minus 35 degrees Celsius. Considerable gains in energy efficiency can be achieved using an Azipod® propulsion system, with up to 20 percent fuel reduction. The delivery schedule is due to start in 2013 and the vessel will be delivered to Rosmorport in 2015. The extreme conditions north of the Arctic Circle demand constant availability and high-energy efficiency from all systems on board,” said Veli-Matti Reinikkala, head of ABB’s Process Automation division. “ABB’s solutions will ensure the reliability and maneuverability required for this type of ship’s operation. This agreement represents a very significant milestone for us, underlining our excellent reputation in the Russian market as a long-term, reliable partner and reinforcing our global leadership in supplying propulsion for icebreaking vessels. ABB will provide integrated power generation and distribution systems, thruster motors, fire-fighting pump motors as well as 25 MW propulsion systems. The propulsion system of the vessel features two Azipod® thruster units (power output 2 x 7,5 MW) and one centerline arranged shafting with a fixed pitch propeller generating additional 10MW output. All Azipod® propulsion units for this project are specifically designed for extreme Arctic ice class RMRS Icebreaker-8. New mine will be truckless to save around 77% of diesel annually; fully automated for personnel safety. Zurich, Switzerland, September 11, 2012 - ABB, the leading power and automation technology group, has won orders totaling $140 million from Vale S.A. (Vale) to supply automation and electrical equipment for the world’s largest iron ore project investment, which comprises in the development of a mine and a processing plant located in Brazil. The orders were booked during the first quarter. Located in the Amazon region in northern Brazil, the Carajás Serra Sul S11D project, comprising the mine and processing plant, represents an $8 billion investment. The project is expected to be delivered in the second half of 2016 and Vale is expecting the issuance of the project’s implementation license in the first half of 2013. The project will use shiftable conveyor belts instead of off-highway trucks to transport the iron ore from the mine to the processing plant. This is the first time a “truckless” solution will be used on a large scale at an iron ore mine. Truckless systems significantly reduce operating costs and produce lower carbon emissions. If the S11D mine were to be operated using trucks, it would need around 100 off-highway trucks and consume 77% more diesel per year. For comparison, Vale’s Northern system, located in Carajás, produced 110 million tons in 2011; S11D will have an estimated nominal capacity of 90 million tons per year after the ramp up phase is concluded. Increased development of mineral resources and mining technologies across the globe represent a key global mega-trend that is an important focus area for ABB’s long-term growth. This project profits from ABB’s deep understanding of advanced solutions for the mining industry. ABB will provide the automation and electrification to transport the ore into the processing plant, and will completely automate all plant processes. The order includes a centralized 800xA control system for processing operations, so that personnel can be located away from the site, for improved safety and continued production. ABB’s solution also enables the automatic recovery and piling of iron ore by controlling and positioning equipment through satellite signal and via GPS, and by using 3D scanning for field screening. ABB will also provide electrical infrastructure for the new processing plant, related energy distribution equipment for reliable and consistent power supply, and engineering and installation services. The delivery includes medium and low voltage motors for use with frequency converters, the primary power transmission stations, duplication of the telecom system for the railroad and 37 secondary substations in self-contained E-Houses (electrical houses). The world’s largest HVDC transformers recently travelled from Ludvika in Sweden to Porto Velho in Brazil by rail, road and ship to form an integral part of the Rio-Madeira project – the longest transmission link in the world. 2012-06-20 - The world’s largest HVDC transformers recently travelled from Ludvika in Sweden to Porto Velho in Brazil by rail, road and ship to form an integral part of the Rio-Madeira project – the longest transmission link in the world. ABB is writing yet another chapter in the history power transmission with the Rio-Madeira HVDC (high voltage direct current) project. This power super-highway will link two new hydropower plants in the northwest of Brazil with São Paulo, its main economic hub, covering a distance of more than 2,500 kilometers. When completed this will be the longest transmission link in the world. Seven massive 600 kV HVDC power transformers are among the key components that will regulate power flow and facilitate the efficient and reliable transmission of electricity to consumers across this vast distance. Each transformer tank has a net weight of nearly 400 tons, making them the largest such transformers ever built. But first these transformers had to travel all the way from Ludvika in Sweden, across the Atlantic and then up the Rio Madeira river, to their final destination of Porto Velho in Brazil. This exciting journey across oceans, cities and villages by rail, road and ship requires immaculate planning and logistics to cover each stage one day at a time. The first part of the journey was by rail from Ludvika to the Swedish port of Oxelösund where the transformers were loaded onto an ocean-going vessel headed for the city of Manaus in Brazil. The journey across the Atlantic took 20 days. In Manaus each transformer was carefully placed on a barge to continue its voyage up the Rio Madeira river to Porto Velho. Given the weight of each transformer, seven meters of river depth was required for the barge to be able to navigate and this could only be assured during the autumn rains. From Porto Velho it was a 20 kilometer journey to the site. For this final stage the transformers were placed on a giant freight trailer drawn by five pulling trucks that cautiously made their way by already existing and prepared roads that were specially tested in advance. This exciting journey came to its logical conclusion when the transformers finally reached their destination, ready for installation at the substation site. ABB once again proves its ability to tackle the toughest of challenges and to develop, design and deliver leading-edge technology to any part of the world. Hannover, Germany, April 23 - Chinese Premier Wen Jiabao and his German counterpart Angela Merkel visited ABB booth at Hannover Fair in the northwestern German city. He watched ABB’s robots working in the booth and listened to an update on ABB’s development in Germany and in China. Brice Koch, Executive Vice President of ABB Group and Peter Terwiesch, Head of ABB Central Europe and ABB Germany received the senior delegations from China and Germany. “ABB’s technology has helped Germany in its ‘energy turnaround’ and is helping China build a stronger and smarter grid. ABB has large scale manufacturing and business operation activities in both countries which together with USA, are the top three markets for ABB,“ said Peter Terwiesch. The two leaders watched how three ABB robots work as a team in processing industry activity. One of the robots is called Chinese Dragon, which was developed by ABB’s R&D team in Shanghai and was the smallest and fastest 6-axis robot in ABB’s robot family. ABB is the first multinational company that brings both Robotics R&D and manufacturing to China. Many other senior government and business visitors also visited ABB’s 1,750 sqm booth, which is one of the largest at the event. Visitors showed special interest in ABB’s smart grid, HVDC, offshore wind power, EV fast charging station at the event. Vice Minister of MIIT Liu Lihua also visited ABB’s booth. He spent time in front of ABB’s Smart Grid 3D demo off shore wind, HVDC demos. He played with the different modules of HVDC demo, and experienced the fast charging system at the e-mobility area. A record number of more than 7,000 registered visitors are expected to visit the ABB booth this year, among them, many are customers from China. Hannover Fair, which started in 1947, is the world’s largest and most influential industrial fair. The Hannover Fair 2012, entitled “Green Intelligence”, offers a global platform to showcase ideas and technologies for a better tomorrow. Being the official partner country for the Hannover Fair this year, China has more than 500 companies attending the event, making 10% of the total exhibitors. ABB has a long history of participating in Hannover Fair since its first show in 1947. It’s an important partner of the event. ABB (www.abb.com) is a leader in power and automation technologies that enable utility and industry customers to improve their performance while lowering environmental impact. The ABB Group of companies operates in around 100 countries and employs about 135,000 people. ABB has a full range of business activities in China, including R&D, manufacturing, sales and services, with 18,300 employees, 35 local companies, and an extensive sales and service network across 80 cities. In China's 12th 5 year plan Energy efficiency and the use of Renewable Energy resources has been indicated as a key area for China to develop and invest. This Focus has created excellent business opportunities for ABB Automation in China. In China's 12th 5 year plan Energy efficiency and the use of Renewable Energy resources has been indicated as a key area for China to develop and invest. This Focus has created excellent business opportunities for ABB Automation in China. With the rapid industrialization of China over the years ABB has been an important player in the Energy efficiency and Renewable Energy market for its range of Automation Technologies. For the last 0 years China has focused a lot of investment in improving Energy Efficiency in Industry, Commercial sector and the efficient use of Energy in the Residential sector as well. With ABB Automation full range of products its very well placed to help China achieve its targets for more Energy efficiency. ABB technologies such as Drive technologies, Energy efficient Motors, HVDC Power technologies are all very successful and a great contributor to China's Energy efficiency drive. 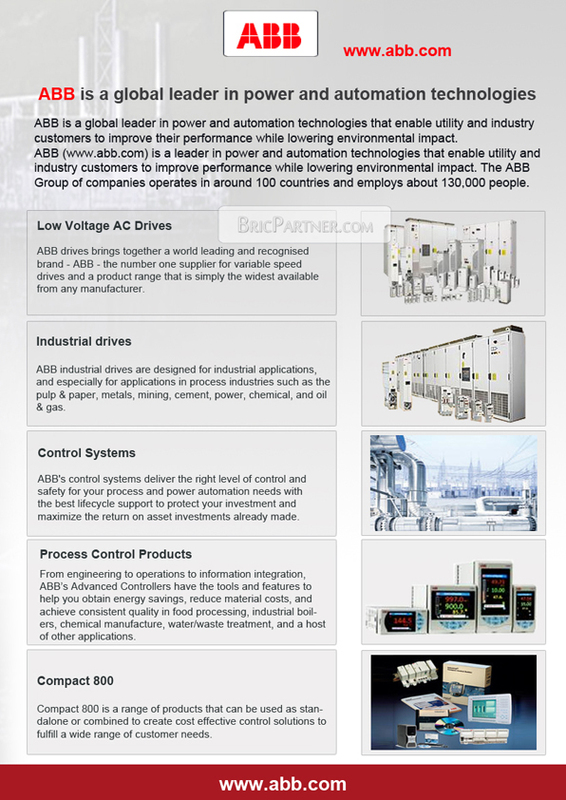 ABB Automation is Targeting a wide range of Industries and focusing on each industry’s individual need. ABB Automation works in Industries such as Cement, Aluminium, Marine, Mining, Power and Energy and focuses on the different needs and demands of these industry’s in China. With ABB world wide experience in all these industry’s this will only further ABB successful drive to help China in becoming more Energy efficient. ABB is having great success in utilising its full range of Energy Efficiency Technologies to the China market and the products it sells to China are mostly made in China which enables ABB to be more effective in the market place. In Renewable s ABB is just starting to push out its recent investment in Concentrated Thermal Solar with Linear Fuel Cell Technologies and its just starting to looking for opportunities to develop Business for this range of products as it does in Germany. For ABB China is a key market and currently its either its Primary or Secondary market and will possibly be its leading market in the near future which very much depends what happens in the US market as China Develops. With the rapid growth in China and its recent commitment in CO2 reduction ABB expects China will be its number 1 market for its Automation and Energy efficiency technology for many years. For 2011 ABB Power and Automation Business have been very strong in China and it expects to remain very strong for its Business in China in 2012. Zurich, Switzerland, Sept. 22, 2011 – ABB, the leading power and automation technology group, has won an order worth $71 million from Steel Authority of India Limited (SAIL) to supply a substation package for its Bhilai Steel Plant located in the central Indian state of Chhattisgarh. The new high voltage substations will enable the additional power supply needed to support a planned increase in the steel plant’s annual production capacity from 5 million to 7 million tons. ABB will design, supply, install and commission the substations as part of a turnkey solution. Key products to be supplied include switchgear, transformers, cables, fire protection and detection systems and a range of other power equipment. ABB will also install the substation automation systems, incorporating the latest IEC 61850 compliant protection and control equipment. IEC 61850 is an international standard that ensures interoperability and open communications between substation devices and other grid installations.The project is scheduled to be completed by 2013. Substations are key installations in the power grid that transform voltage levels and facilitate the efficient transmission and distribution of electricity. They include equipment that protects and controls the flow of electrical power. ABB is the world’s leading supplier of air- and gas-insulated substations, with more than 10,000 installations worldwide covering a range of voltage levels up to 1,100 kV. Bhilai Steel Plant is a manufacturing unit of SAIL, a leading Indian steel producer with several production facilities across the country. The company makes rails and heavy steel plates and is a major supplier of structural components. ABB (www.abb.com) is a leader in power and automation technologies that enable utility and industry customers to improve performance while lowering environmental impact. The ABB Group of companies operates in around 100 countries and employs about 130,000 people. Zurich, Switzerland, Sep.21, 2011 – ABB, the leading power and automation technology group, has won orders worth around $14 million from Galvão Energia SA to supply a new transformer substation and lay power cables to facilitate the transmission of electricity from a wind farm currently under construction in the northeastern state of Rio Grande do Norte. ABB will deliver a turnkey 34.5/138 kV (kilovolt) substation and lay 60 kilometers of 34.5 kV cables to connect four new wind power plants with a total capacity of 94 MW (megawatt) to the national grid. Some of the key products to be supplied include the high- and medium-voltage gas-insulated switchgear, step-up transformers, instrument transformers and surge arresters. ABB will also provide the control and protection system compliant with the global IEC 61850 open communications standard, as well as telecommunication and supervisory control and data acquisition (SCADA) systems. These will enable local and remote control of the substation together with its monitoring and efficient real-time management. As part of the turnkey project, ABB is responsible for the design, engineering, supply, erection, commissioning and start-up of the substation including civil works. The project is scheduled to be handed over in September 2012. Substations are key installations in the power grid that facilitate the efficient transmission and distribution of electricity. They include equipment that protects and controls the flow of electrical power. ABB is the world’s leading supplier of air- and gas-insulated substations covering a range of voltage levels up to 1,100 kV. Galvão Energia SA is a leading Brazilian power company specializing in the development, installation and operation of plants that generate electricity from renewable sources such as wind and hydro. ABB (www.abb.com) is a leader in power and automation technologies that enable utility and industry customers to improve performance while lowering their environmental impact. The ABB Group of companies operates in around 100 countries and employs about 130,000 people.